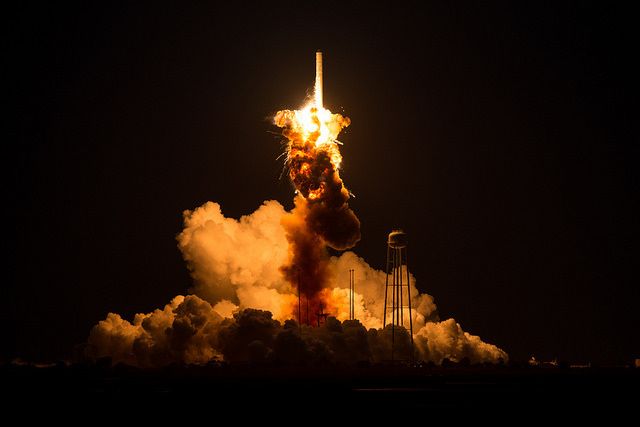 An Orbital ATK investigation into last year’s Antares rocket crash in Virginia identified a decades-old manufacturing defect inside an AJ26 engine turbopump as the most likely cause of the failure, but a team of NASA engineers was not so sure in their report. Both panels set up to look at the Antares failure traced the start of the mishap to a liquid oxygen turbopump inside one of the rocket’s first stage AJ26 engines, finding that an explosion inside the engine approximately 15 seconds after launch occurred when a spinning rotor fell out of position and contacted other components within the turbopump’s hydraulic balance assembly. An accident investigation board led by Orbital ATK — the Antares rocket’s developer and operator — singled out a manufacturing defect in the turbine housing bearing bore of the liquid oxygen turbopump of Engine No. 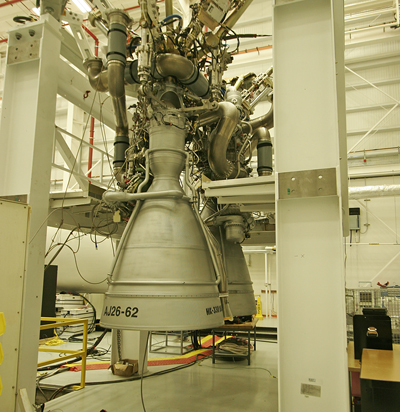 1, also known as Engine E15, on the Antares booster as the failure’s most probable cause. The Antares engines were built more than 40 years ago by the Soviet Union’s Kuznetsov Design Bureau for the N1 moon rocket. When the Soviet moon program was canceled, officials put the engines — called NK-33s in Russia — in long-term storage before Aerojet Rocketdyne imported the powerplants to the United States in the 1990s. 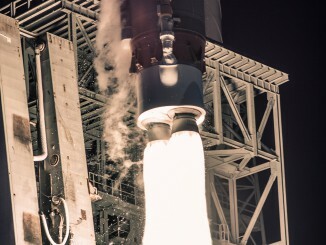 In a departure from Orbital ATK’s findings, an independent review team set up by NASA, known as the IRT, reported three technical root causes that could have contributed to the launch failure, which destroyed the rocket and its Cygnus supply ship payload heading for the International Space Station. An executive summary of NASA’s IRT report said investigators also identified the machining error as one of three possible causes. Engineers discovered a similar defect in the bearing bore housing of another AJ26 engine that failed during a ground test in May 2014, according to the report, but another engine with the flaw has completed an extended series of ground firings with no problems. NASA’s investigation also found an engine design flaw or foreign object debris could have led to the October 2014 launch failure. 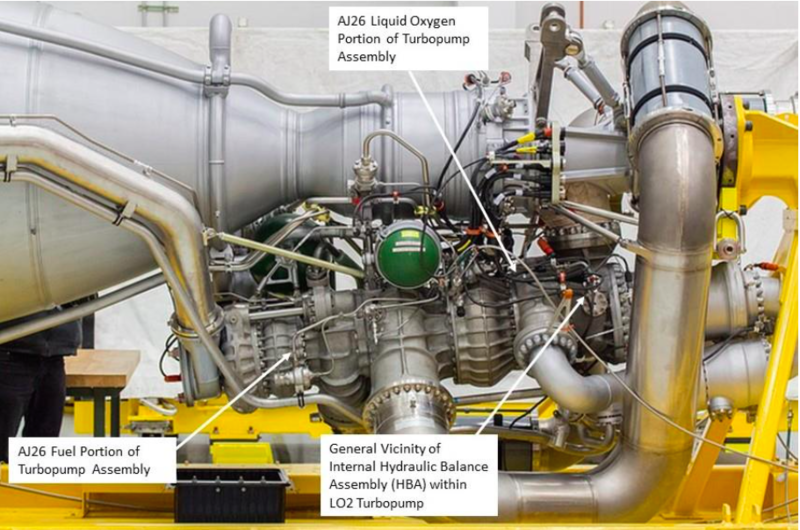 NASA investigators said the AJ26 engine’s ground test program was not rigorous enough to screen for the design concerns and potential workmanship issues. Experts who examined wreckage from the Antares engines found titanium and silica foreign object debris inside Engine E15 that was there prior to its impact on the beach near the rocket’s launch pad in Virginia, according to a summary of NASA’s IRT report. But NASA officials said they could not draw any firm conclusions on how much contamination was in the engine at the time of the explosion. Inspections of other engine components recovered after the failure indicate there were not “gross levels” of foreign debris in the engine, and NASA added there is “no clear forensic evidence” that the contamination directly or indirectly led to the accident. Orbital ATK’s failure report, which was submitted to the Federal Aviation Administration, also addressed other credible causes, including the long-term storage of the engines that may have led to corrosion. Aerojet Rocketdyne, Orbital ATK’s AJ26 engine supplier, blamed the explosion on debris sucked into the engine from the rocket’s propellant tank, a failure mode that would exonerate the company from fault. Orbital and Aerojet settled their dispute in September, when Aerojet agreed to pay Orbital $50 million in cash and terminate the AJ26 engine deal. Orbital ATK had already announced a switch to newly-built Russian RD-181 engines to replace the AJ26 on future Antares missions. NASA’s report into the October 2014 mishap also said Orbital ATK and Aerojet Rocketdyne lacked insight and knowledge of the design and operational history of the NK-33/AJ26 engines, preventing the companies from developing accurate risk estimates for Antares launches. “The service providers and NASA should have sufficient technical expertise and insight into the design, development, test and failure history of the engines (as well as all launch vehicle systems),” NASA investigators recommended. The agency’s engineers also proprietary restrictions “may be serving as an artificial barrier to communications and leading to communication shortfalls” in NASA’s commercial cargo program, which has contracts with Orbital ATK and SpaceX to ferry supplies to the space station. 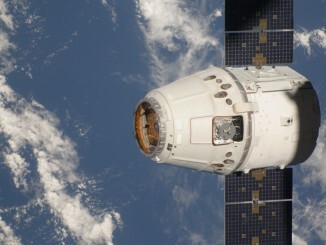 SpaceX’s investigation into its own failure, which destroyed a Dragon space station cargo craft minutes after a launch in June, is nearing completion. NASA did not establish an independent review team to look into SpaceX’s Falcon 9 launch failure, but the agency’s Launch Services Program, which manages NASA’s spacecraft launch contracts, is conducting its own review. While noting the overall success of the commercial resupply services initiative, NASA’s report recommends the agency reorganize groups responsible for the commercial cargo program’s launch vehicle assessments, calling for the establishment of a new working group within the space station program office and wider dissemination of design and anomaly information to personnel supporting the rocket assessments. The Antares rocket’s return-to-flight with new RD-181 engines is scheduled for May. Orbital ATK’s Cygnus supply ship will launch to the space station twice on United Launch Alliance Atlas 5 rockets before then. “Our team and partners are devoting maximum efforts to returning the Antares rocket to flight in early 2016. 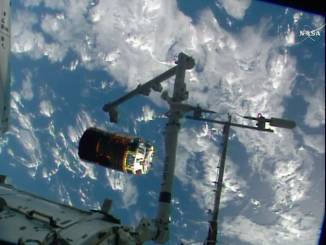 We are committed to fulfilling our commitments to NASA under the CRS-1 cargo delivery program, and we are prepared to continue International Space Station resupply services in the years ahead,” said Scott Lehr, president of Orbital ATK’s flight systems group, in a statement.